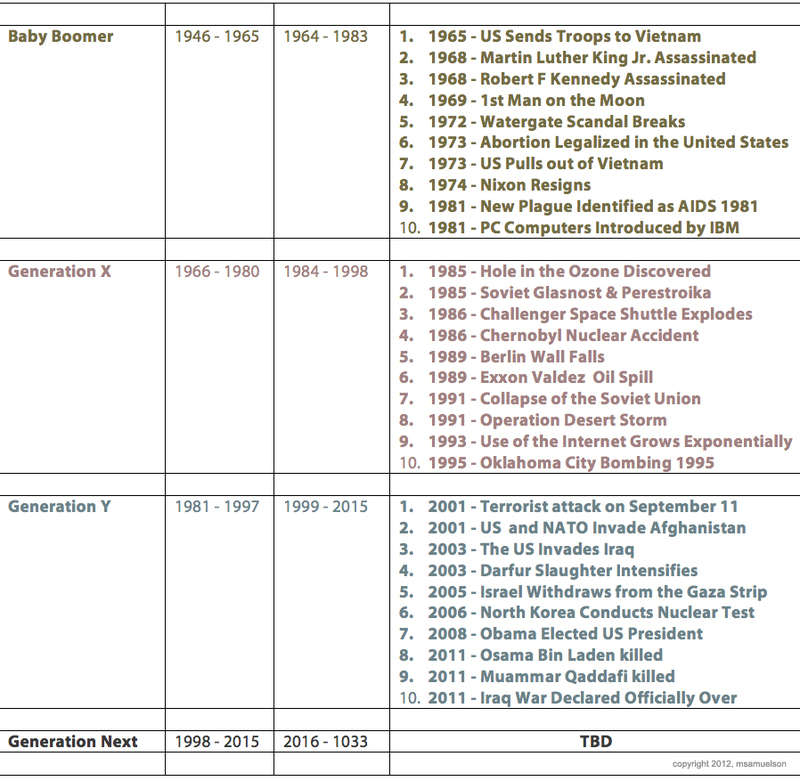 The following chart is my take on the ten critical events that helped shape each of the six generations that came-of-age (turned 18) beginning in 1900. These events are among those that dominated the headlines in US newspapers and influenced social, psychological, political and economic interactions at work, home and within the community at-large. Besides being conversation starters and “On this Day…” factoid fillers, an awareness and basic understanding of these events — and their role in shaping the American consciousness — is critical for anyone charged with and/or vested in cross-generation and cross-culture communication. This includes teachers, parents, supervisors, lawyers, marketers, religious leaders, politicians, city planners, product designers, healthcare providers and wellness professionals. And, unless you’re living in a cave on the outskirts of Lost Springs, Wyoming, this includes you and your family. Because of awareness and control factors, I prefer to use a coming-of-age parameter instead of the customary — and variable — birth-year markers. For instance, in my case, I was born in 1948 making me an early member of the Baby Boomer generation. 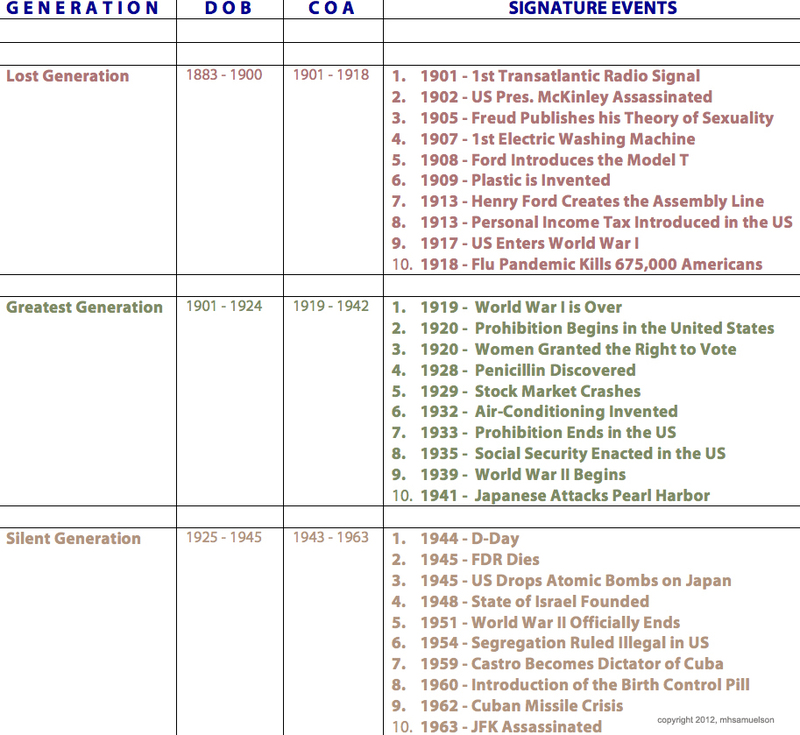 Certainly, the key events of the late 40s and the 1950s had an impact on my world but not, consciously, my worldview. Besides, what could I do? I was just a little kid growing up in Jamestown, New York. Events like Israel becoming a State, World War II declared “officially” over, Castro overthrowing Batista, Brown v. The Board of Education of Topeka, and the launch of Sputnik took a backseat to family, friends, little league baseball, learning Altar-Boy-Latin and staying on the good side of the Good Sisters of Mercy who taught at Saints Peter & Paul school on North Main St.
As a mid-teen, I was intellectually aware of the Cuban Missile Crisis and deeply moved by the assassination of JFK. However, other than make noise, there still wasn’t much I could do. That changed when I legally came of age during the time of Vietnam, Mississippi Burning, the Martin Luther King and Robert Kennedy assassinations, and the growing campus unrest. Converting awareness to action, I left home and enlisted in the military in 1967 at the age of 18 and in 1972 — 1st time eligible — I voted in my first presidential election. For me, 1948 (DOB) initiated the age of birth, growth, and fundamental learning but 1966 (COA) ushered in the age of citizenship, opportunity, and action. So What? & Who Cares? Acknowledging, understanding, and respecting COA signature events pays dividends in many ways, including: gaining attention, advancing rapport, building trust, and enhancing existing relationships. So, next time — instead of profiling according to world-shaking events beginning with the person’s date of birth — go softer on those early years and concentrate on the key happenings that defined the start of their adult years. This is great. I’d like to use your chart as part of a local diversity workshop on generations in the workplace. I will certainly identify you as the author if you are willing to share. These events certainly left their mark resulting in general characteristics that can be used to describe each generation. Yes, of course, Linda. Use any and all of the information presented in this posting and others, as well. May I quote you in my Sunday Sermon? Hi John. Yes, certainly and you may quote from any of my other postings as well. Best wishes!